have visited twenty countries since moving to Germany…and counting. Gentiles: these are something you should really experience, if you never have. You may know them as “potato pancakes,” if you’re not familiar with them from an Eastern European/Jewish cuisine background. Potato pancakes are kind of seasonal fare here in Germany, often sold by street vendors fresh out of the fryer with apple sauce to sweeten them up and cool them down somewhat. We had some at the Weihnachtsmarkt out on the square, but they paled in comparison to the ones I had in Cologne. So Sarah found a recipe, and we made them, and they are just awesome. We were inspired by this recipe. Cut peeled potatoes into chunks or spears and shred in food processor. Cut onions into chunks and shred in food processor.Mix potatoes and onions together in a colander over a large bowl. Allow to drain. Pour mixture into a large bowl and add beaten eggs, salt, pepper, baking powder, sugar, and a tablespoon of flour at-a-time until mixture holds together. Mix well. In a fry pan, melt shortening. You’ll need about 1/8″. Spoon heaping tablespoons of the mixture into the oil. Flatten each spoonful with the back of the spoon to make thin latkes. Fry until the edges turn a dark brown. Flip over to fry the other side. Drain on a paper towel. Serve with apple sauce and/or sour cream. Note: this recipe is full-strength. For a half-batch, I counted the tablespoons of flour necessary to get the potato/onion/egg mixture to bind: 12. So figure on 24 tablespoons of flour for the full-batch, but don’t forget to add them one at a time. Max and I have decided that there’s no reason to go out for dinner anymore as we can make our own really good food, cheap. We had brats and cabbage last night. The cabbage was cooked in the crock pot for about 8 hours. We also had Vidalia Onion Pie which is fabulous! To wrap up the dinner we had a potato mixture that he concocted which was great. I’ll send you the recipes to try. 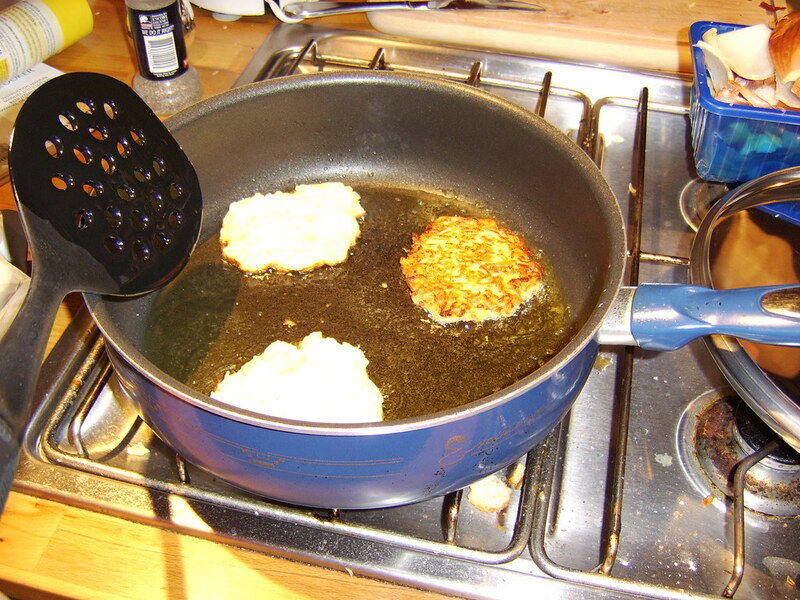 The latke recipe has made me hungry. It sounds SOO good! Next Next post: Shalom, Chanukkah! Care for some pudding?